Nihad A. Hassan is an independent computer security & forensic consultant. He has been actively conducting research on computer forensic techniques for more than 8 years. 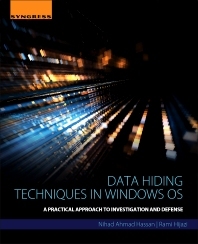 Nihad focuses on the subject of computer forensics and anti-forensic techniques in Windows® OS, especially the digital steganography techniques. Nihad has completed numerous technical security consulting engagements involving security architectures, penetration testing, Windows® OS diagnostic reviews, disaster recovery planning and computer crime investigation. He has written thousands of pages of technical documentation for different global companies in the IT and cybersecurity fields in both languages, Arabic & English. His writing style highlights the fact that information is simplified and is presented it in an easy manner, which gives him a wide reputation in this field. Nihad believes that security concerns are best addressed by well-prepared and security-savvy individuals. He also enjoys being involved in security training, education, motivation. His current work is focused on network security, penetration testing, computer forensic, anti-forensics techniques and web security assessment. Nihad has a BSc honors degree in computer science from the University of Greenwich in the UK. Rami Hijazi is the General Manager of MERICLER Inc., an education and corporate training firm in Toronto, Canada. Rami is an experienced IT professional who lectures on a wide array of topics, including Object-Oriented Programming, Java, eCommerce, Agile development, database design, and data handling analysis. Rami also works as consultant to Cyber Boundaries Inc., where he is involved in the design of encryption systems and wireless networks, intrusion detection and data breach tracking, as well as planning and development advice for IT departments concerning contingency planning.